To delete a photo, just follow these easy steps! *At this time, there is not a way to delete a photo from the Android app, but it's on our radar for the future! For now, just follow the instructions to delete a photo from the website. 1. From the Me tab, click into your Activities view and then click into the activity you want. 2. Swipe left over the activity map until you reach the photo you want to delete. 3. Click on the photo to enter the full screen photo view. 4. Tap once again on the photo so that you see the blue bar appear at the bottom. 5. Tap the three dots on the bottom right, then select "Remove picture." 6. You're all set and you'll be redirected back to the activity view! Visit the activity page from the runkeeper.com website. Click on the photo you'd like to delete. 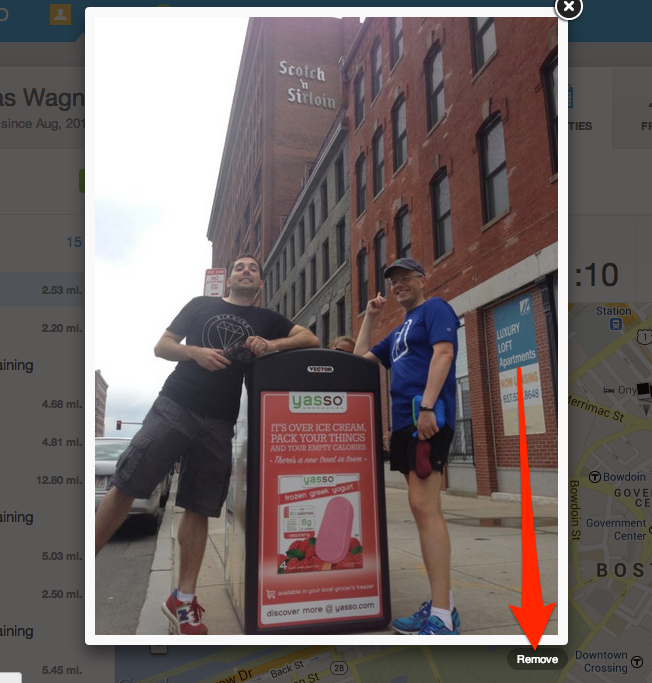 The photo will be located on your activity map at the GPS point where you took the picture! Hit the Remove button located bottom right of the photo. Confirm the delete by hitting the green Remove button. And, just like that, say goodbye to your photo.